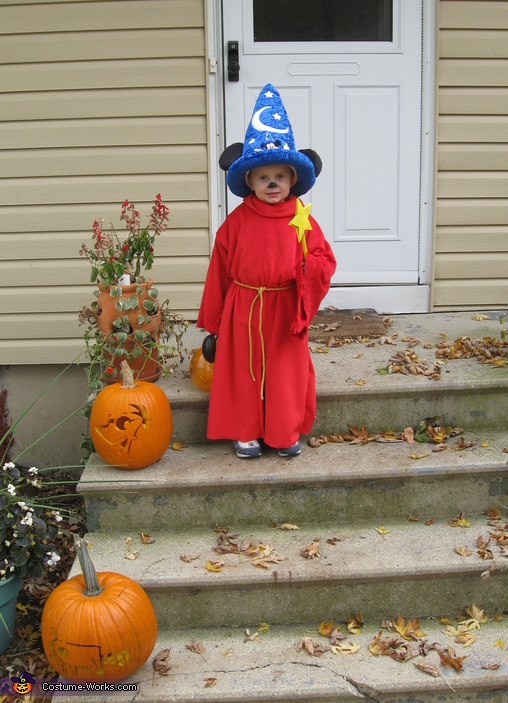 This is my son Alexander wearing his Sorcerer Mickey Costume. We got the hat at Disney World last Christmas and he really wanted to wear it for Halloween. How did you make the sorcerer robe? How did you make the robe? hey lady mind telling me where you got that suit from??? Did you make the robe? Is there a pattern for it? My Grandson just got the hat at Disney and wants to wear it for Halloween. I actually uses two patterns.... I got a pattern for a choir rob for the sleeves and the collar, and I used the body for a Shepard ' s tunic. I let my son pick the red fabric from Joann, and the belt is just gold tie back cord that eh also picked at joann.